With the capture of the Bosnian Serb war crimes suspect Ratko Mladic, the BBC's Paul Martin recalls trying to track him down, in this despatch for radio first broadcast in 2008. Thick-set guards with walkie talkies and body armour blocked the way to the front gate. I was walking towards a two-storey villa in a leafy suburb of Belgrade, the house that I was pretty sure was sheltering one of Eastern Europe's most notorious indicted war criminals, General Ratko Mladic. "This is diplomatic property," said one of the guards in good English, as he thrust me hard up against a jeep. After a few messages his walkie-talkie crackled again and they released me, with a warning that next time I would not be so lucky. That was 2002, just after the former Yugoslav president Slobodan Milosevic was put on trial in The Hague for orchestrating the Bosnian war. 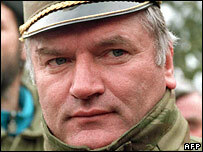 A lady told me she would often see Gen Mladic strolling in a park, close to a big military base, with his sweet little dog. But soon after my visit he disappeared again - presumably protected by elements of the Serb military, some of whom still saw him as a patriotic hero. I had met the general several times before. The last encounter was in the mid-1990s on top of a mountain that, despite a supposed ceasefire, he and his armed band of Serb militiamen had just captured from Bosniak (Bosnian Muslim) fighters. He was standing with an air of triumph on his large round face. He was handing over the mountain, near the city of Sarajevo, to the United Nations' forces in a bizarre Serb-imposed ceremony on a ski slope beside two cable cars. The city, you will recall, had been the venue for the 1984 Winter Olympics. On the mountain peak Gen Mladic gave us our long-promised interview, pledging he would conquer all of Sarajevo soon, and walked to a helicopter camouflaged nearby. "Oh," I said. "I thought all sides agreed to the United Nations ban on using any form of aircraft in this war?" The general stared at me with his expressionless blue eyes and his thick-set jaw got even thicker. "The commander of the Bosnian Serb armed forces does not ride on a donkey," he said. And seconds later he was airborne. Gen Mladic could hardly hide his contempt for the international figures who were trying to keep this war from getting even worse. He would deliberately mispronounce the name of the European Union's chief envoy David Owen, for example. He called him David O-van, which means David the Sheep in Serbo-Croat. He would take any visitor on a trip around his home village in Bosnia and show them every location where he said 101 people from his own extended family had lived before they were, he said, slaughtered by a pro-Nazi band of Muslim fighters during World War II. Yes, this war was personal. 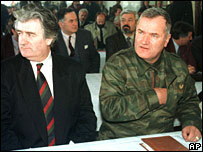 Gen Mladic had served in the Yugoslav army so long he knew many of the commanders on the opposing Bosnian Muslim and Croat sides. He would even radio them - their ex-Yugoslav army walkie talkies all had the same frequency - and ask about their health, their wives, their children, then inform them: "In 10 minutes we're gonna knock you guys to hell and back," or some such wording. His relationship with the political leader of the Bosnian Serbs, Radovan Karadzic - who is now being tried at The Hague - was somewhat uneasy. I once asked him, as the two men stood together, who took orders from whom. "I report to him," said Gen Mladic. "But I am in command of fighting this war." Mr Karadzic gave the impression he found the fighting somewhat distasteful. I once heard him screaming for silence from a group of drunken Serb fighters as they sang war songs and let off volleys of gunfire from the back of their armoured vehicle as it pulled up near his headquarters in Pale, another former ski resort overlooking besieged Sarajevo. Mr Karadzic was obsessed by the rule of the Turkish Ottoman empire, which he thought was being re-imposed, and cursed the Americans for supporting the side of the Muslims. One day he insisted we fly with him by helicopter to see what he called a massacre of Serb villagers by marauding Muslim fighters. The helicopter ducked and dived to avoid potential ground fire. Mr Karadzic seemed unwell, he cowered in his seat, blocking both ears with his hands. His loyal wife Liljana put her hands in front of our camera and ordered us not to film him in that position. "The world does not need to blame him for getting air sick as well," she said. When we landed we found 28 Serb bodies, all men of fighting age, laid out in Vlasenica's town square. Mr Karadzic turned to our camera and said: "If this goes on, I think there will not be many Muslims left in Bosnia." A foretaste of the ethnic cleansing that was to become the grim hallmark of the war. 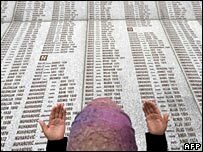 After Karadzic, is Mladic next?